Verlinden detail set and Dangerboy Hobbies wing fold used. I guess by now enough has been said and written about the history of this great airplane so I guess that I will not go into that. I purchased the kit by mail order about 5 years ago and like most, only got around to building it recently. In the meanwhile, I obtained the Verlinden detail set and wingfold details from KMC. It was a real pain trying to obtain the KMC wingfold detail since it was already out of production when I wanted it. Anyway, I was fortunate to obtain a set through a friend. On opening this set, I was impressed by the resin castings and the photo-etched details, but alas the instruction sheet did not explain clearly how one was supposed to install the folded wings. Since it looked pretty fragile to me, I decided to abandon the idea of displaying the model with the wings folded... Thankfully, Dangerboy announced the release of their wingfold set and I gladly got my hands on a set after all the rave reviews. the excellent descriptions for each construction step. As usual, construction began with the cockpit interior. I used all the kit parts except the pilot's seat which was replaced with the resin part from the Verlinden set. I added lead foil belts and fuse wire buckles to the radio operator's seat and spray painted the interior according to the instructions. A thin black-brown wash of water colours was applied to accentuate the details and the entire interior was further highlighted by drybrushing a lighter shade of the basic colour over the raised detail. The dorsal gun turret was also assembled and painted as per the kit instructions with only the addition of the electrical junction box from the Verlinden set. and used these with the AM kit's crankcase. I just got the engine to fit although it is slightly off centre when viewed from the front. I decided not to correct this and live with the imperfection. Construction of the rest of the kit went rather smoothly. The inner wing portion of the Dangerboy wingfold set was superglued to the fuselage. One of these had to be trimmed down slightly in profile as it did not fit properly in the fuselage recess. Having obtained the Verlinden set and noting that it would be a pity not to display the gun bay, I took the bold step of opening the gun bay and ammo compartment in the solid resin wing. This was achieved with a motor tool and the appropriate routing bits. The sides of the compartments were boxed in with styrene sheets and painted accordingly. The ammo box was displayed opened to show the belted 50 cal. rounds. The 50 cal. ammo was from True Details etched parts. The 50 cal. machine gun from the Verlinden set was used although my references seemed to suggest that it was way overscale. The fuselage and the wings were painted as separate entities. I sprayed the white and masked off these areas for the gull gray topside colour. To achieve the soft demarcation, I masked the separation line with blue tack. Testors enamels were used throughout. 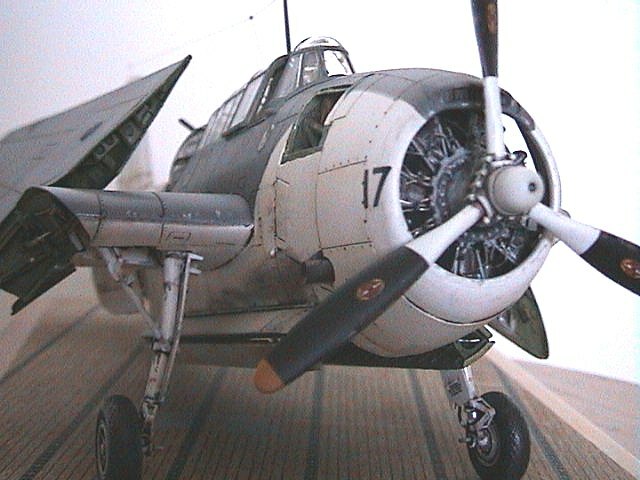 After allowing the paint to cure for about three days, the model was sprayed with Humbrol gloss clear varnish in preparation for decal application. Decals were excellent and reacted well to the setting solutions which I used. In fact, for the national insignia on the wings, my over zealous application of Aeromaster Sol caused some tearing; these areas were duly touched up when the decals were fully set. My only gripe during the application of the decals were that the diagrams in the instruction sheet were vague, with no indication of the decals' orientation. This was especially irritating with the smaller stencil decals. When the decals were fully set, the model was wiped with a cloth dampened with a mild detergent solution to remove any traces of decal residue. The model was sprayed again with clear gloss varnish. Panel lines were accentuated with a dark brown wash of water colours and the faded effect on the paint work was simulated by spraying selected panels with a thinned solution of the base colour lightened with about 40 percent white. After allowing to dry for about a day, Testors Dullcote was sprayed. Slight paint chipping, exhaust stains and oil streaks were added before being sprayed again with another coat of Dullcote. 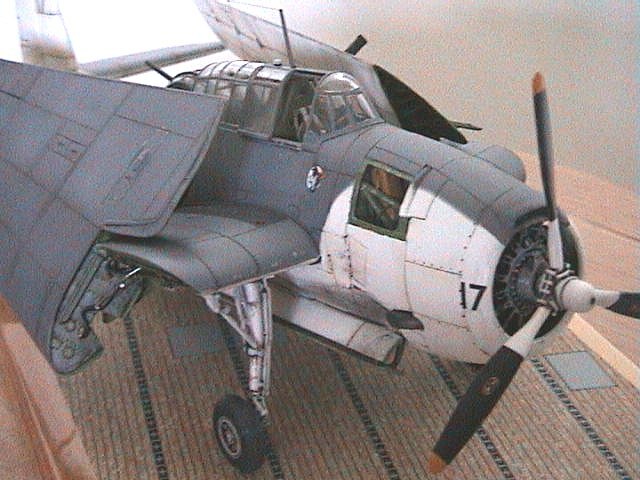 The gun turret, canopy and antenna wire were added at this stage together with the wings in their folded position. Take note that the wing fold attachment plugs have to be trimmed and adjusted since they were not symmetrical. The wings in the folded position were epoxied in place and left to dry. 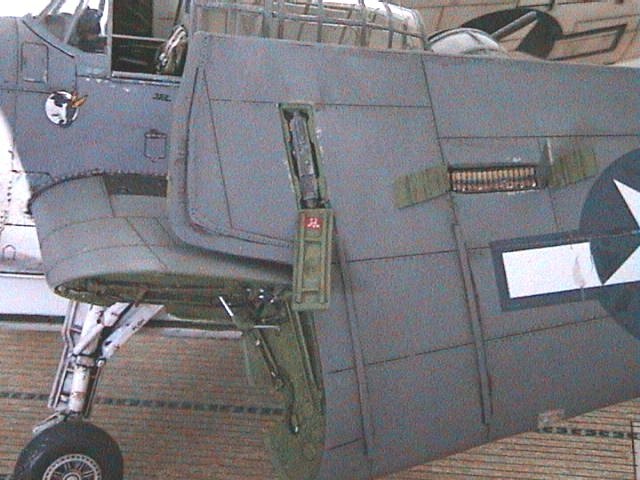 The ammo box lid, hatches and gun bay hatch were then attached. Actuating arms for the wing folds were added from brass wire and plastic scraps super glued in place based on the excellent close up photograph of the wing fold detail supplied with the KMC set. I do not normally mount my models on a base, but as I wanted to minimize handling of the model, I decided to mount the model on a base. 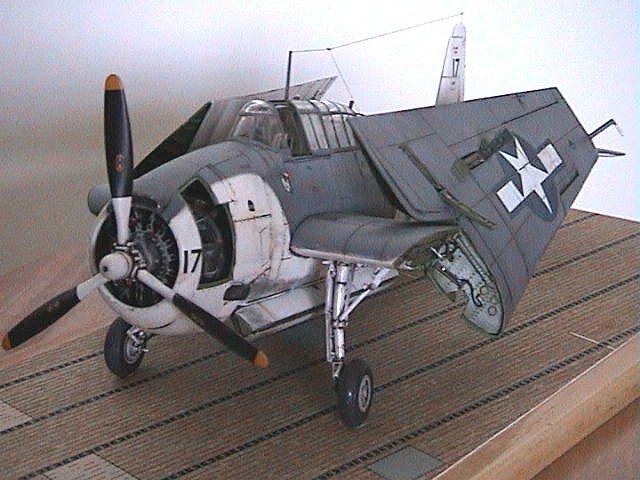 Verlinden's US World War 2 carrier deck was pasted on a wooden base and given several coats of Testors Dullcote from a spray can to eliminate the slight sheen. The model was then secured to the base with self tapping screws. Overall, this proved to be a very enjoyable project. I completed this model over eight months. The Dangerboy wingfold set simplified things a lot, especially for those like me who intend to pose the aircraft with the wings folded but find difficulty with the more complex KMC set or scratchbuilding. I do not build to enter contests or even strive for perfection so I hope you readers out there can forgive me if you find a few blemishes, imperfections, glue stains or technical errors in these pictures. Nov 2004 update: Please note that Dangerboy is now out of business and their materials are no longer available.